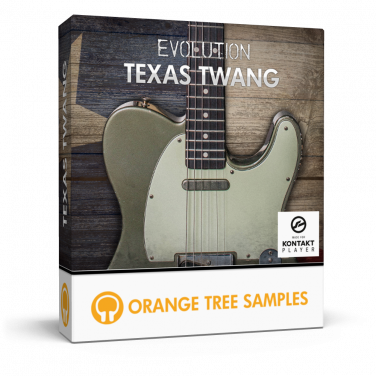 Evolution Texas Twang features a custom single cut Tele-style guitar with dual single-coil pickups. The bridge pickup gives you that nasally twang perfect for percussive chicken picking and bright crunchy tones, while the neck provides you with a juicy, full sound just right for mellower tones. Because we recorded both pickup signals separately you can dial in any blend of the pickups you want. The guitar was performed and recorded by Chris Bullard, a seasoned session guitarist and emerging Country singer-songwriter. 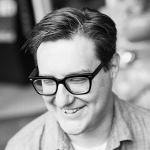 Chris Bullard's experience as a touring artist in Texas and Nashville adds an authentic vibe to the guitar samples. The clarity and finesse of his guitar playing are audible in the many articulations included in the library, from picked playing to articulations particularly useful in Country music, such as finger plucked articulations for chicken picking technique. 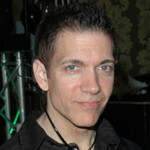 The library was developed in collaboration with William Derganc, who oversaw the project's development as well as editing the guitar samples and contributing factory presets. His attention to detail was invaluable, setting a high bar for the quality of the library. The sample set has also been run through a distortion pedal as an enhanced signal. This distortion pedal, well-known among Country music guitarists, is modeled after the legendary warm, overdriven sound of a Trainwreck amp. 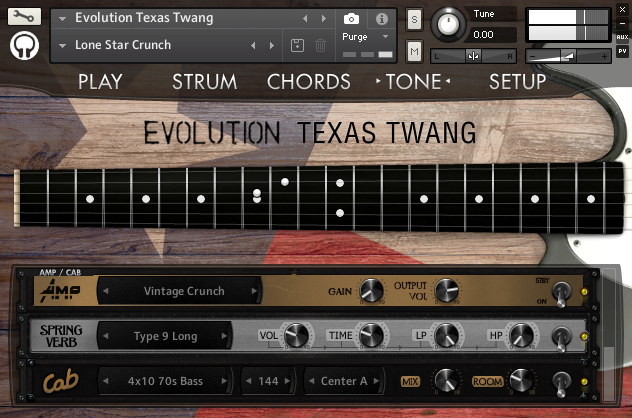 Evolution Texas Twang is outfitted with our Evolution guitar engine which provides you with a wealth of appointments: an innovative strumming pattern editor, automatic chord detection, and a robust effects engine. The library includes many factory presets for ready-to-use classic and modern Country electric guitar tones that fit right into the mix. - Built-in effects engine for instantly-usable Country electric guitar tones. - 21 GB (compressed to 8.92 GB using the lossless NCW audio format) of 24-bit samples. - Articulations such as sustains, palm mutes, mutes, natural harmonics, plucked open/muted articulations for "chicken picking", plus special effects like string slaps, muted strums, and more. 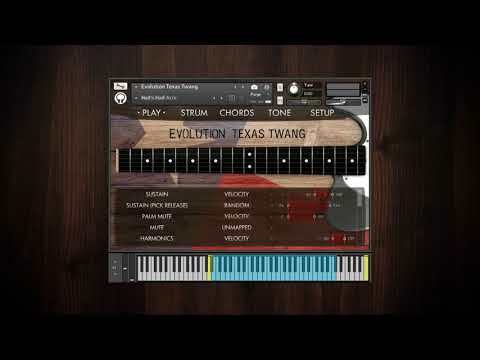 Evolution Texas Twang licenses Native Instruments' Kontakt Player sampler software. 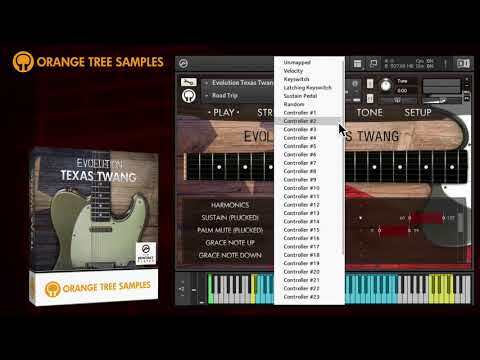 Consequently, owning the full version of Kontakt is not necessary, and Evolution Texas Twang operates without limitations within the free Kontakt Player application/plugin. This also allows the sample library to be listed in the libraries tab in Kontakt for convenient access. Evolution Texas Twang is NKS-ready. The integration with the Native Kontrol Standard presents many benefits, both when using the library in the Komplete Kontrol software as well as in conjunction with Komplete Kontrol hardware, such as the Komplete Kontrol S-Series keyboards and Maschine. 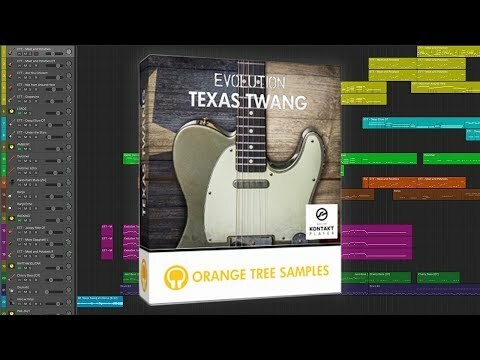 In addition to Evolution Texas Twang being displayed in the Native Browser among your other Komplete Kontrol instruments, there are a variety of other benefits. For example, thanks to Native Instruments’ Native Map® technology, you can control the library’s various parameters directly through connected hardware right out of the box. 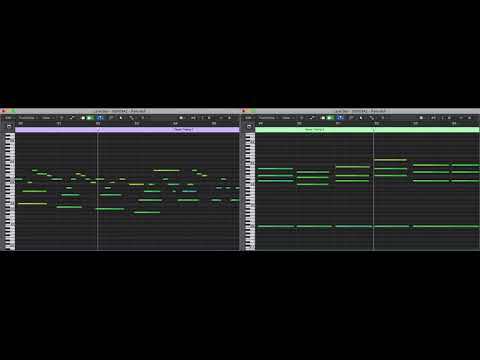 Furthermore, the keyswitches and key ranges are shown using Light Guide, an innovative technology that displays the key colors directly on your Komplete Kontrol S-Series keyboard. We recommend using Evolution Texas Twang with a Komplete Kontrol S-Series keyboard for the full experience. While not a requirement, you will be able to take advantage of the Native Kontrol Standard for an intuitive connection between software instruments and hardware. This product requires a total of 18.48 GB of free disk space in order to download and install the sample library. The total size of the download is 9.26 GB, and after installed the library occupies 9.22 GB. Windows 7, 8, or 10. Mac OS X 10.11 or newer.